MEMORY SERVES US in de­vious ways. Often we recall oc­currences of the long, long ago (provided we are as old as all that) and summon to mind a ra­ther vivid and clearly defined picture of early days, much more readily than we recollect things and events of a comparatively short time back. A scattered few of us, also, are gifted; we have long memories. Some of us are able to retain figures and facts in our minds better than others. Some take pleasure in remember­ing, while others would rather forget. Taking us all together, we must admit our indebtedness to those who have been able to call to mind the things worth handing down from one generation to another. Those are the people who have made valuable contri­butions toward the preservation of historical material. Among these good rememberers is Miss Florence Morris, who of late years has been a resident of Plymouth. Miss Morris is the youngest daughter of Isaac N. Morris and Emily Thompson Mor­ris, and is the only member of the family living. Ancient Maple Trees Believing that people of the present day would be interested in the history of trees, Miss Mor­ris tells us about some ancient maples, now landmarks near the shore of Lake Maxinkuckee. "My father, Isaac N. Morris," writes Miss Morris, "bought the farm on the north end of' Lake Maxinkuckee in about the year 1850. The 160 acres of the farm on the north side of the road are now owned by the Dillon heirs; a few acres and the old farm house are owned by Mrs. A. N. Bogardus, and the rest by the Culvers and a few lot owners on Indiana Avenue. And the part of the farm on the south side of the road extended from the road to the lake and from the railroad east to the Aca­demy, and is now owned by the Culvers. "What I want to give, especial­ly, is a history of the large maple trees on the north side of the road or street from the house own­ed by Mrs. Bogardus to the top of the grade, or, to be exact, to Col­onel Rossow's lot. Likewise, I would mention the maple trees on the south side of the street, oppo­site Mrs. Bogqrdus' house, and extending east along the street to the Academy. "These large maple trees I have mentioned were set out by my father and two brothers, Milton and Edmund Morris, before the Civil War--probably about 1858 or 1859. "I thought these trees were old enough to deserve mention. "Nearly every one calls that street Faculty Row, but the re­corded name of the street on the Plat is Indiana Avenue. "The maple trees on Morris Street from Indiana Avenue south to the Maxinkuckee Inn were set out by my brother, Edmund Mor­ris, in the year 1884. "I deeded away the last bit of the Morris farm to the Culvers in 1932 and moved to Plymouth." Burr Oak Cemetery Continuing her recollections of this region, Miss Morris writes: "I will give you a little history of the Burr Oak cemetery known per­haps to only a few that are now living. My grandfather, John Morris, owned land in the Burr Oak Flats and donated the plot of ground for a cemetery that is now the old part of Burr Oak cemetery. "One of my father's brothers, John M. Morris, and one of his sisters, Mrs. Phebe (Morris) Vor­eis, were the first ones buried in the cemetery, in 1838. Those are the two oldest graves in the ceme­tery." Not many people are living in the township today who can re­member the so-called "Cold New Year," January 1, 1864. Both newspapers published in Plymouth at that time--the "Democrat" and the "Republican" (or vice versa) agreed, mind you, on the inten­sity of the cold being twenty-one degrees below zero. For nearly a week, business was almost entirely suspended, and mails and trains were missing from outside for three days or more. The Thomas Houghton farm homestead, on the Burr Oak road, north of Culver, was built during the winter of the "Cold New Year," we are told by Dennis Ralph Houghton, present owner and occupant. It got so cold that the workmen could not go on with the construction. In the partly finished house, they camped, or soft of "holed in," amid the lum­ber. They built themselves a fire and weathered out the spell of ex­tremely low temperature. The house, nevertheless, is one of the sturdiest and most artfully con­structed residences throughout the countryside. Marmont in the 'Nineties George E. Nearpass, III; of Ind­ianapolis, who has already given us an account of the township's first newspaper, established here by his father in 1894, says that he could recall many of the old times around Marmont and Culver. "There were very few sidewalks in town when we moved there," he relates. "I remember also when the old Colonnade Hotel, which stood across from the depot, burn­ed down. The passenger train years ago stopped thirty minutes at Marmont, for dinner at the Colonnade Hotel, and on Sundays the trains would bring into the village around five and six thousand peo­ple on excursions, to spend the day at the lake." No longer are there people left who can recall the days of the pioneers, the 'thirties and 'forties of the last century. They would have to be close to the hundred mark in age, or rather beyond it, to be able to do so. A few, however, are able to give us the recollections of their parents or other members of the family older than themselves--recollections told in years gone by and remembered and brought down to us today. Hunting, they tell us, played a big part in pioneer life. During the early days of the township there were some noted hunters, crack shots, "born with a rifle in their hands," but not with "a silver spoon in their mouth." The hunters often traveled great distances in quest of game. Sometimes the Indians that were friendly went along an the hunt­ing party with the whites. The Indians, like the game, were then quite numerous. Bear, deer, wolves, wild turkeys, and other large game were plentiful. Various stories are told regard­ing pioneer hunting and hunts­men. Tales are told also of the deer at the lake. They were num­erous 'way back then. One of the king-bee hunters of this neighbor­hood used to hunt the deer with a pack of dogs, and he got 'em. Some other hunters got something else; they also got the "buck ague," so we are told. "The old time doctor rises into view, A well read man he was; and much he knew. His massive saddle-bags with drugs o'er ran; But calomel and jalap led the van." The first resident physician in this region was Dr. Thomas Lo­gan, who settled in the Wolf Creek neighborhood in 1836. He was among the first doctors to settle permanently in the county. He located here in the summer of '36. Dr. Jerolomon, of Logansport, was the physician in charge dur­ing the removal of the Indians to the West in 1838. He accompanied the caravan that left Twin Lakes on September 4th of that year, under the conduct of General John Tipton. Not much is said about the old time fisherman needing the old time doctor. On the Contrary, fish­ing was said to cure a multitude of ancient ills. Many in these parts were "born with a fishing pole in their hands." Very little is said about, fish ague, but many were afflicted with tales of fish that towed dug-out canoes around the lake (with passengers) and sever­al monsters of assorted shapes and sizes that lurked in the waters of Maxinkuckee, and even in smaller near-by bodies of water. One of the local fishermen of considerable renown and recog­nized prowess, who fished in later days, but not so very much later than the pioneer anglers, was James McGuire. Some thirty years ago, he was known as "Grandpa McGuire," and later yet as "Old Grandpa McGuire." He lived in what is one of the oldest dwell­ings in Culver, a low-built house, the second west of the Evangelical Church. Old Grandpa McGuire fished and fished, and kept on fishing until he was past eighty years of age. At the age of eighty, in Oc­tober, 1905, he caught a big straw bass, one of the largest bass ever taken from Lake Maxinkuckee up to that time. He got it at the de­pot pier on the second of October. And it was guaranteed and ac­credited and bona fide and true. The fish was 24 inches long, 15 inches around, and weighed seven pounds. He took it with an ordin­ary cane pole and, medium sized hook. Grandpa McGuire was an old time fisherman who lived in an old time house. And speaking of old time houses, there was the "Neigh­bor" Cromley homestead, gone now, which stood on Main Street where Rector's Pharmacy is now. It was still there around 1898, as a number of people recollect, an old frame house, which sat back from the street a bit and had a yard around it. The yard was fenced. A beautiful big maple tree used to stand in front of the house. There is a circle today in the concrete sidewalk in front of Rec­tor's, showing where the tree stood. To the north was the Easterday frame two-story building business home of "Easterday Bros." The site is now occupied by the north end of the Knights of Pythias building. There was a dirt wall along the street, except for a rais­ed plank walk across the front of the Easterday lot. An awning above, at the front of the building, sheltered this walk. Beyond the Easterday building, to the north, the land was open and unoccupied, and was fenced from the street. Other Old Houses Among the oldest houses in Cul­ver, in the opinion of Clark Fer­rier, is the third house north of the cemetery, and the second house north of the Methodist par­sonage. The Gandy homestead, formerly at the corner of Main Street and Lake Shore Drive, is another old residence. Then, there is the old Bradley house, above Wickizer's on Lake Shore Drive. The "old Grandpa McGuire House" has already been mention­ed. It is a low house, the second west of the Evangelical Church. Eastward from Young's store in south Culver stands one of the oldest dwellings in town. It is lo­cated on the south side of the lane or street that leads toward the lake from Main Street. It is a frame house that was moved some time back from another lo­cation, near the concrete block house. On the west side of Plymouth Street, half way between Jeffer­son and Washington Streets, is an old house, said to have been a parsonage at one time. It is also said to have been moved to this location. Still another ancient house is the former Doctor Durr house, east of the police station that is now Lake Street. It is on the east side of the street, between Lake Shore Drive and Washington Street, in the Knapp Addition. Dr. G. A. Durr once owned the house and dwelt there. It is a low-built house. We are told that there used to be a gravel pit on the Durr proper­ty, sort of back of where Oliver Shilling now lives. The oldest barn in town, ac­cording to "Neighbor" Cromley, who should know, is the Doctor Durr barn. The Durr barn is a real antiqui­ty. It is located now on the rear of widow Augusta Warner's pro­perty on Lakeview Street. The barn is on an alley, between Lake­view Street and Harding Court. Along towards 1933 and '34, it began to lean, the roof let in a surplus of rain and daylight, it was getting feeble, and the owner had thoughts of having it demol­ished for safety's sake. It was us­ed then as a shed for wood, im­plements and so forth. This barn is a quite remarkable building. The beams of the frame are hewn, and pinned with wood­en pins. The cross beams support­ing the loft floor are mostly tam­arack, left whole, in their natural ­state and unstripped of bark. To­day they are as hard and tough as iron, from aging. Above the north end of the barn, in its present position, there is a high loft. The south end of the barn, where the horses were stabled, is spaced low­er, both as to ground floor and to loft. "Neighbor" Cromley Recollects In his younger days, "Neighbor" Cromley worked for Dr. G. A. Durr for about a month. "That was the Doctor's barn," says Mr, Cromley. "It still stands, an old shell. It used to stand right on the corner where the old jail used to be. That and the old house that used to be under the pine trees near the depot are the only two buildings, I remem­ber being here when I came to town, and are still here. The barn is now old Mrs. Warner's pro­perty." "Neighbor" Cromley tells how he used to drive for the Doctor, and ride with him, too. Back in those days, the Doctor used to go to his patients on horseback. "Neighbor" Cromley, as a youth, would go with him. "I usually rode horse back," he said. "The Doctor would go out in the cold­est weather on God's earth, on horseback. "Doctor Durr was a French­man, the old Doctor, and he was killed at Plymouth; I think by a horse that kicked him." The "old Doctor Durr," as he was usually referred to, was Dr. Gustavus Adolphus Durr, a native, so biographers tell us, of Baden Baden, Germany, who on coming to America, located at Monterey and moved to Lake Maxinkuckee in 1856. And, says McDonald, he remained to practice there until his death at the age of sixty-one years. REAR, LEFT TO RIGHT---John Mitchell, John Osborn, Mrs. Tom Hoffman, Mr. Hoffman, W. O. Osborn, Mrs. S. J. Lenon, Mr. Lenon, J. W. Riggens. Mrs. Riggens. FOURTH ROW--0. T. Goss, Mrs. W. O. Osborn A. B. Holt, Mrs. Arthur Morris, Mr. Morris, Mrs. Holt, Mrs. T. E. Slattery. THIRD ROW­--Mrs. Otto Stabenow, daughter Mildred, Charles Replogle. Ray Poore, T. E. Slattery. SECOND ROW -- ­Mrs. O. T. Goss, Mrs. John Osborn. FRONT--Otto Stabenow. House Under the Pines The oldest house in Culver, "Neighbor" Cromley believes, is the one moved from under the pine trees near the railroad depot. It was there in the fall of '54, he recalls. "It was the first house I noticed when I came down here," he says. "It was wild here then. That house is the only one left of those that were here in those days." "Cape" Wiseman lived there as a boy, in the old "pine trees" house. At the age of ten, Tim Wolfe recollects, he rode a mule past the little old house. "It looked just about the way it does today," he says. "It was old then, and it was built like an old-time barn, with a heavy hewn frame." Ezra Hawkins says it is maybe the oldest house in Culver. He re­calls no others older. The house, when it stood on its little knoll near the railroad sta­tion, was a landmark. And so were the twin pines there. The house stood between or under the big old trees, bath of which are still standing. They are tall ones, and used to dwarf the house, which was built low anyway. The station agents lived there and W. T. Parish moved the house, reset it, and put a canopy over the front entrance, some time in the period of 1920-25. The back part of the present house, now lo­cated on a lot on the east side of Lake Street, is newer than the front, so it appears. The back part was there, however, before the house was moved. The Arthur Simpson family liv­ed in the house for a while. A few years ago, an old man who said he had lived around here over fifty years back, returned to this section. He had wandered back with the purpose of revisit­ing the scenes of his younger days. He knew all about the old settlers and the landmarks of oth­er days. He said that things looked changed, and he wondered what had become of the old house under the pine trees. That was one of the landmarks he recalled very distinctly. The plot where this house stood, overlooking the lake, is one of those ancient parcels of land possessing a truly pioneer background and a voluminous ab­stract of title, harking back to the days when "ye redskins were abroad in ye land." Time has wrought many changes in mater­ial things. "To have and to hold!" Memory alone seems to have that privilege. Speaking of old things in the line of buildings, there was the pump factory that sat in front of what is now Milner's tin shop. Wooden pumps were made there. From about the location of the pump factory, a canal used to lead to the lake. A promoter came and hatched up a big idea of having a picnic or pleasure ground in there, close to the lake. But not a great deal came of it. The ice industry on Lake Max­inkuckee was an important one in years gone by. Its history would fill a good-sized chapter. Various ice houses have seen service at the lake, but they are about all gone now. One of the old ice houses be­longed to Holt of Indianapolis. The "Maxinkuckee Ice Company" was busy around the year 1905. Of late years, the Medbourn Ice Company has held the field alone. Some People had their own pri­vate ice houses. Daniel Walter had one, and built an addition to it in December, 1905. Many will re­call Walter's meat market. Hollingsworth & Reamer were owners of ice houses that were burned in June, 1906, Clark Fer­rier tells us. These were rebuilt, however, in 1906-07. In the spring of '08, in May, to be exact, Ferrier traded his lum­beryard at Lakeville for the ice houses at Lake Maxinkuckee. Then along came a cyclone in June and blew them down. There was a tower-like elevator at one end of the ice houses. Clark Fer­rier was in there, when a terrific wind came suddenly from the west-by-southwest. Several boats were on the lake. The occupants scarcely had a chance to act be­fore the blow was upon them. Then came a dash for the near­est share, and they all got in, al­though same just made it and that's all. They were just in the nick of time. Some were hoisted up the wall at the ice house. While this was going on, the big frame structure was rent asunder. Then pandemonium was let loose. Boards and timbers went flying lakeward. The front wall fell over on the railroad tracks as the roof and other parts of the building flew across and into the lake, which became strewn with the wreckage. The railroad tracks were im­passable until such a time as they could be cleared. The lake had been whipped into an angry sea, and nothing could have rode out the storm less than a steamboat. It was all so sudden. And what a wild time was had by all while it lasted! The first registered farm name in the county was that applied to the John C. Butler farm in Union Township, and rightly so, for this farm is located in the area to which the first settlers came. The Butler farm was regis­tered at the Recorder's office in Plymouth as the "Linden." The linden tree from which the farm was named is on the property to this day. It has been carefully pre­served. An act of the legislature pro­vided for the registration of farm names. The owner of the farm pays one dollar to the County Re­corder and in a special book pro­vided the farm is recorded in his name. Record is made of the spe­cial name the owner gives to his farm, with a description of the land. A certificate is given him showing that this has been done. Interest in some of the old­-time customs and forms of amuse­ment was still fairly keen during the early part of the 20th Cen­tury. 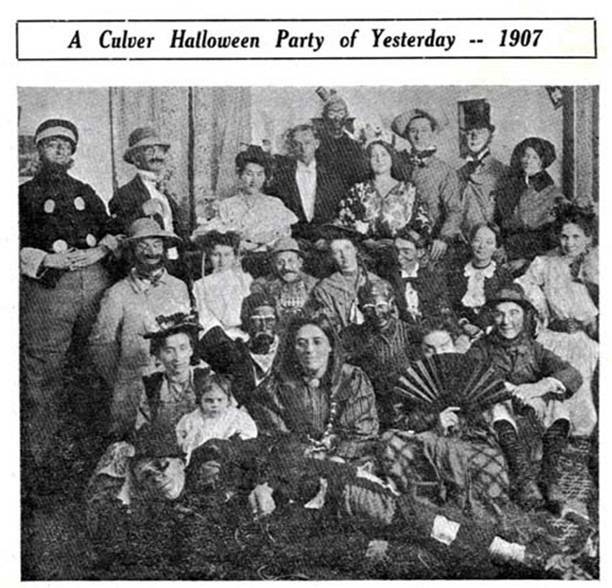 An old-fashioned spelling school, held one evening near the beginning of December, 1905, in Osborn's building, Culver, was carried through with much of the original spirit and formalities. Leaders were appointed to divide the house and appoint trappers and tellers or runners. Forty min­utes were spent in spelling around. A recess followed to allow all to play "Drop the Handker­chief" and other old but very en­joyable games. After recess those taking part proceeded to spell dawn, and the one holding the floor was awarded a prize. The McGuffey Spelling Book was used. The proceeds of this occasion, in­cidentally, went to the Culver school library. It was clearly demonstrated in that particular revival of the spelling school that the old tim­ers, those over forty years of age, were the better spellers. They did their work with an air of confi­dence, and pronounced each word as it was spelled, while the young­er generation neglected to pro­nounce their words, and ended each one with an interrogation point and a look of inquiry to the teacher, anxious to know whether they guessed correctly. The house was divided by Dr. Parker and Mrs. Charity Stahl. Miss Edna Stahl and J. H. Koontz were chos­en trappers, and L. C. Dillion and Frank Baker tellers. The side chosen by Mrs. Stahl missed the least number of words, and in spelling down, Dr. O. A. Rea held the floor the longest.